The federal government proposed Friday that oil and natural gas companies will have to disclose the hydraulic fracturing chemicals they use on public lands, reports John Broder of The New York Times: "In a significant concession to the oil industry, companies will have to reveal the composition of fluids only after they have completed drilling — a sharp change from the government’s original proposal, which would have required disclosure of the chemicals 30 days before a well could be started." Broder reports industry lobbyists and several major oil and gas companies have been meeting at the White House since the original regulation was proposed in February "to address industry concerns about overlapping state regulations and the cost of compliance." The Interior Department wanted to address landowners' concerns about groundwater pollution, Broder reports. Interior Secretary Ken Salazar said the revised rule was part of the federal government's overall energy strategy. The bill provides $7 billion for construction and deployment of the network, and "authorizes the auction of a block of wireless broadband spectrum to pay for it," Moore reports. 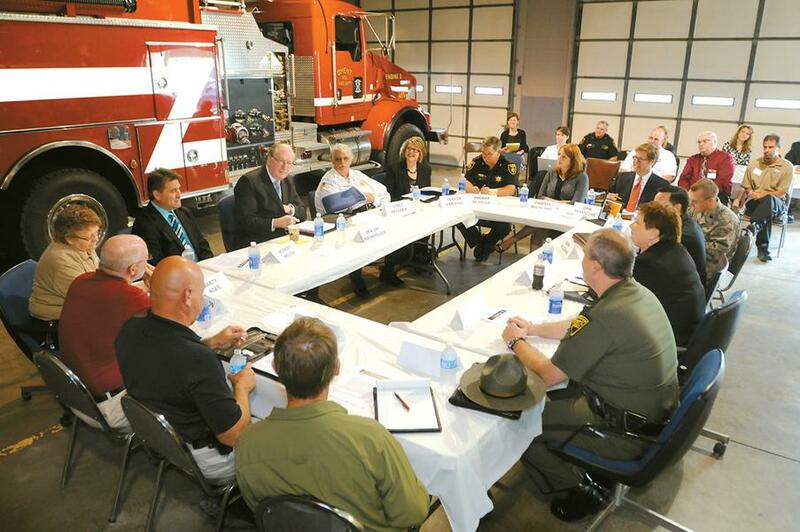 It would create an entity within the Department of Commerce called First Responder Network Authority, or FirstNet, that would oversee the program. Rockefeller said the program will likely cost $11 to $12 billion before it's completely implemented. Samantha Swindler and Adam Sulfridge, former managing editor and current reporter at the Times-Tribune in Corbin, Ky., whose stories about corrupt sheriff Lawrence Hodge led to his conviction and imprisonment, will be featured Sunday on CBS-TV's "60 Minutes." Swindler's work won her the 2010 Tom and Pat Gish Award for courage, tenacity and integrity in rural journalism from the Institute for Rural Journalism and Community Issues. "The way Sulfridge and Swindler got to Hodge was a painstaking investigation into all the arrests he had made," a press release about the episode says. "They uncovered a pattern of cases involving guns and drugs in which suspicious deals were cut and sentences drastically reduced; the defendants’ lawyer in nearly all the cases was a friend of the sheriff’s. In most of the cases, Hodge was taking cash and or drugs from the criminals in exchange for the deals. The result was an explosive series of stories and eventually, Hodge’s arrest." Canadian energy company TransCanada reapplied today for a permit to finish building its Keystone XL pipeline after it faced opposition from ranchers, environmentalists and others who wanted the route changed to avoid the Oglala Aquifer and the ecologically sensitive Sandhills region of Nebraska. The application would cover the section of the pipeline from the U.S.-Canadian border in Montana to Steele City, Neb. Public pressure helped to hasten the end of horse slaughter in the United States in 2006 when Congress cut off funding to inspect facilities that do the work. Without proper inspection and oversight, horse meat could not be shipped to overseas markets where it might be consumed. But such a ban has been tough on the horses that are being shipped to Canada and Mexico, reports The Wall Street Journal. It has also been disastrous for some horses whose owners, facing a bad economy, have left them abandoned and starving, to fend for themselves. Congress re-authorized funds last year for slaughterhouse inspections. Some U.S. companies are again applying for permits to revive the industry in New Mexico, Missouri and California. Rick De Los Santos, spokesman for 0Valley Meat Co. in Roswell, N.M., says the proposed facility could supply as many as 50 jobs and could be open by the end of the summer. The pushback from animal rights activists and horse lovers -- even by New Mexico's own governor -- has been strong. The journal Nature recently offered analysis of the productivity of 66 farm yields, comparing industrial versus organic methods. Since then, there's been much discussion about its two main findings: Organic farming yields were 25 percent lower on average than those that employed industrial methods, but only for grain crops like wheat, not in crops like fruits and vegetables. Philpott analyzed stories about the study in The New York Times and Time Magazine. The Times made a case for "a hybrid path in agriculture" incorporating both industrial-style production and organic practices when they made sense, Philpott reports. Time's headline wondered: "Why Organic Agriculture May Not Be So Sustainable." Such reporting doesn't take into account anything but gross output per acre, argues Philpott. There was no consideration of, "ecological trouble like the plight of honeybees and other pollinators in a sea of pesticide-laced crops or resources consumed, like synthetic nitrogen-laced fertilized, which is made of natural gas." By focusing on yield, "the authors presume that maximizing production should be the chief goal for policymakers," writes Philpott. But from a global perspective, the emphasis now is on "what we grow, where we grow it and who grows it." Friday, May 4 is the deadline to to submit entries for the 2012 Carmage Walls Commentary Prize sponsored by the Southern Newspaper Publishers Association. Cash prizes of $1,000 will be awarded in two circulation categories – over and under 50,000. Second-place winners will receive $500. The awards recognize outstanding commentary on local issues and are designed to encourage thoughtful, courageous and constructive editorial page leadership on issues relevant to a newspaper’s primary readership. The prize was named for B. Carmage Walls, whose over seven decades primarily owned community newspapers and advocated strong, courageous and positive editorial leadership. The awards will be presented during the News Industry Summit in Naples, Fla., Sept. 30 through Oct. 2. For an entry form, click here. The most significant change would take the school's agricultural land for development or some other type of use. 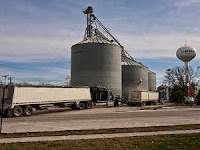 The site in question is close to dairy farms, and students and faculty maintain a silo and produce hay there. Equine program staffer Sarah Hamilton said the site is "imperative" to the continuation of the school's agricultural programs, especially since recent state budget cuts took $80,000 from the agricultural sciences program. Chemicals used in hydraulic fracturing of oil and gas wells could migrate toward drinking-water supplies more quickly than previously thought, according to a study funded by two upstate New York organizations opposed to drilling and fracking in the Marcellus Shale region. Using computer modeling, the study found that natural faults and fractures in the ground, exacerbated by fracking, could allow chemicals to reach the surface in a few years. Scientists have presumed some layers of rock were impermeable and would keep fracking chemicals trapped almost far below the surface. This view has been a "cornerstone of the industry's argument that fracking poses minimal threats to the environment," reports Abraham Lustgarten of ProPublica. The study's lead author, Tom Myers, said that view was false. "The Marcellus Shale is being fracked into a very high permeability. Fluids could move from most any injection process," he said. Major airlines accelerated cutbacks over the last three years because of the recession, rising fuel prices and company mergers. This led many to stop flights to smaller airports that serve many rural areas, making flight times to and from small cities longer, reports Jad Mouawad of The New York Times. The move has forced at least three regional airports into bankruptcy since 2010. The country's top 25 airports lost 4 percent of domestic nonstop capacity from 2006 to 2011. The smallest airports lost 19 percent. Atmosphere Research Group President Jeffrey Breen said this has forced most airports to lose nonstop flights, "but the smaller airports are really the ones that have taken it on the chin the most." As a result, travelers face more complicated trips that often involve connections at hub airports, Mouawad reports. The U.S. Department of Agriculture announced guidance this week to strengthen the food industry's ability to trace contaminated products through the supply chain, Michael Fielding of Meatingplace reports. The agency also announced it will no longer wait for confirmation of food-borne illnesses before investigating, saying it wants to take a preventative approach instead of a reactive one. 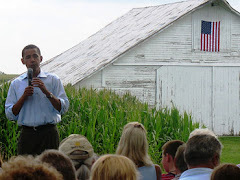 "One remarkable aspect of the 2008 Obama campaign was its success in carrying rural counties in battleground states such as Colorado and Iowa, the same counties which Democratic presidential candidate John Kerry had lost four years earlier," Tom Curry of MSNBC writes. "Whether Obama’s field organizers can repeat their 2008 success with rural voters this year depends on both symbolism and substance." Thousands of post offices across the country, most in rural areas, still face closure in two weeks if the U.S. House doesn't complete work on its version of the Senate's post office bill, reports Ron Nixon of The New York Times. Nixon reports House lawmakers don't seem in a hurry to proceed on the bill which would overhaul the U.S. Postal Service despite the May 15 deadline. Senators who co-sponsored the bill called on House leaders to bring the bill to the floor for a vote in a letter, which read: "We fear that the resulting degradation of mail service will further drive away postal customers, only hastening the loss of postal revenue, the accelerating contraction of mail processing and mail-related industry, and further loss of associated jobs." Since Alabama passed a law in 2006 making it a crime for mothers to chemically endanger their babies, about 60 expectant mothers have been prosecuted, Ada Calhoun reports in The New York Times Magazine. The law was originally enacted to protect children from meth labs, but with the increase in addiction among pregnant women in the state's rural areas came more convictions of mothers. In other states, Calhoun reports criminal convictions of new mothers is rare because, in most states, such cases are considered a matter for child-protection agencies. Some women's rights groups, civil libertarians and gynecologists say the law goes too far when new mothers are convicted and sent to jail. They contend that such cases set a bad precedent, making pregnant women "a special class of people that should be treated differently from every other citizen," said Emma Ketteringham, director of legal advocacy at the National Advocates for Pregnant Women. In one case, Amanda Kimbrough was convicted and sentenced to 10 years to life in prison after her newborn son died because he was born addicted to drugs. A National Institute of Health study has quantified the frequency of prescriptions for narcotics in emergency rooms for the first time. Painkillers were prescribed three out of four visits to the ER from 1997 to 2007. That was a rise of 26 percent over the 10-year period. Comparatively, a prescription for antibiotics was prescribed in one of every two visits.The report was published in the journal Medical Care. Catherine Saint Louis of The New York Times reports that doctors can usually tell when someone is simply trying to get a fix, but other times, "it's difficult to make an objective assessment. Emergency doctors, said Yale School of Medicine's Gail D'Onofrio, "err on the side of treating pain." Many ER doctors acknowledge that they write a lot of prescriptions for painkillers, but say they feel they face a conundrum because some patients are genuinely in pain. "The Obama administration made a terrible mistake last week by dropping proposed rules designed to protect young children ... hired as farm hands," writs Susan Hogan of the Minneapolis Star Tribune. She contends that "caving" to big agriculture and Republicans puts children's lives at risk because farming remains one of the most dangerous jobs for adults, and even more so for children. Hogan said the Labor Department was "on the right track" last year when it proposed 15 new rules to keep young workers safe. "Many of the suggested safety measures were practical, such as seat belts for tractors and rollover bars on farm vehicles in which children often are hurt," she wrote, adding that the agency was right to ban children from jobs including handling pesticides, working in manure pits or grain bins, and that several studies backed them up. Personal income in rural counties increased by 3.5 percent from 2009 to 2010, more than the 2.8 percent increase in the nation as a whole, according to Bureau of Economic Analysis data. Total per capita income in rural counties is now 80 percent of the national average. The Daily Yonder map (below) shows income gains in rural counties. Dark green counties saw income increases of more than 5 percent, light green saw "above average" gains of 2.8 to 5 percent, light red areas show gains of less than 2.8 percent and red areas indicate a per capita income loss. More than 1,300 rural counties saw increases. Food and beverage industries are winning the battle against obesity, to the detriment of millions of overweight children, many of whom live in rural areas, report Duff Wilson and Janet Roberts of the Reuters news service. The industries have "never lost a significant political battle in the United States despite mounting scientific evidence of the role of unhealthy food and children's marketing in obesity," they write. Lobbying records analyzed by Reuters reveal that the industries more than doubled their lobbying efforts over the past three years. 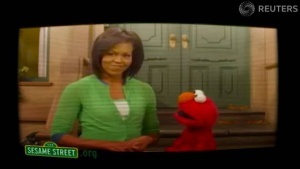 The reporters found that the White House backed off some anti-obesity steps in the face of industry lobbying though Michelle Obama, in video above, has led a campaign to fight the epidemic. The industry lobbying dominated policymaking and "defeated government proposals aimed at changing the nation's diet," Wilson and Roberts found. They report that the Center for Science in the Public Interest, the top lobby for healthier food, spent about $70,000 last year; that's about what the food and beverage industry spends on lobbying every 13 hours. 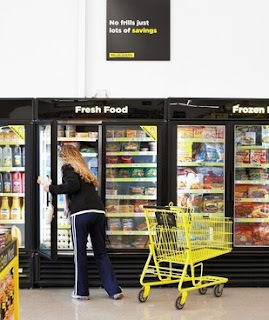 Dollar General Inc., which has discount stores dotting the rural landscape and is one of Wal-Mart's biggest competitors, is branching out and selling groceries, Ann Zimmerman of The Wall Street Journal reports. The company is stocking fresh produce and refrigerated products in midsize "market stores" to draw shoppers more frequently, increasing how much they spend with Dollar General. The market stores haven't been as profitable as the company's traditional stores, but it says the gap is narrowing, Zimmerman reports. She writes that competition among mid-size stores is heating up; Wal-Mart and Target have versions of mid-size stores, and drugstores have sold food and refrigerated items for years. The number of babies born with signs of opiate withdrawal has tripled in a decade because more prescription-painkiller addiction among pregnant women, researchers say. The number of newborns with withdrawal symptoms increased from about 1 per 1,000 in 2000 to more than 3 per 1,000 in 2009. More than 13,000 babies were affected in 2009. The study was released in the Journal of the American Medical Association. Weaning infants from the drugs can take weeks or months and requires lengthy stays in intensive care units, The Associated Press reports. Hospital charges for treating these newborns increased to $720 million from $190 million between 2000 and 2009. The babies aren't addicted, doctors say; their bodies are just dependent on opiates, making it safe to give them small doses of methadone to wean them. The way states track community-college completion varies widely, according to a new tool released by the College Board. Every state tracks enrollment and rates of graduation within three years, but only 10 track completion within six years, which the tool shows is a more accurate measure because community-college students often go to school part time, which takes them longer to finish. Many people in rural areas attend community colleges. Only 12 states track job-placement rates of students who graduate, and 22 do not track students who take remedial classes before enrolling, reports Ben Wieder of Stateline. Virginia, North Carolina and California track the most indicators of community college completion, and 15 track less than 25 percent of the indicators. Wieder reports the tool creators said they hope the data will "help improve the effectiveness and efficiency of community colleges." (Read more) What does your state do? Wind power, we may have a problem. According to a study of satellite data by researchers at the State University of New York at Albany, areas around four of the world's largest wind farms are experiencing local warming trends, compared to nearby areas that don't have the farms. The temperature rise, as measured from 2003 to 2011, is 0.72 degrees Celsius per decade. The results, published in the journal Nature Climate Change, "could be due to the energy expelled by farms and the movement and turbulence generated by turbine rotors," the researchers write. Coal industry lawyers in West Virginia are using the results of several recent court cases to try to convince a federal judge that citizen groups should have little voice in blocking mountaintop-removal coal mining permits. Alpha Natural Resources lawyer Shane Harvey told The Charleston Gazette that Judge Robert C. Chambers should be left "with very little ability" to overrule a pending Army Corps of Engineers permit. Citizen groups have asked Chambers to let them challenge at least two Corps permits in the state -- one to Alpha subsidiary Highland Mining in Logan County and another to a mine in Nellis County. The brief that is causing such a stir points to previous rulings -- a district court ruling, an appeals court decision contrary to a Chambers ruling, and a U.S. Supreme Court decision -- all of which had the effect of quashing public input. Reporter Ken Ward Jr. writes that Chambers didn't initially agree with Harvey's position that federal judges should "defer to the corps' review of applications for the Clean Water Act 'dredge and fill' applications," which are essential to mountaintop-removal jobs. Obama administration lawyers argued against the narrow reading of the law. Rural and remote areas in the U.S. struggle with lack of veterinary care because most vets would rather work in large cities with small animal practices. Two states are trying to deal with this issue in two very different ways. Alaskan lawmakers are considering a bill that would allow out-of-state veterinarians to practice free of charge in remote regions of the state where there aren't any vets, Jill Burke of the Alaska Dispatch reports (photo by Burke). A previous bill would have allowed in-state vets to travel to rural places to deliver care, but in-state vets were opposed. Burke reports vets from outside the state are "convinced that Alaska's villages desperately need vet care and that someone should step up and deliver it." But some officials and vets inside the state say volunteer vets could provide substandard care without state oversight. Later this year, the first Mississippi doctor to take advantage of the Mississippi Rural Physician Scholarship Program will be able to start their career in a place that desperately needs them, make a guaranteed $30,000 a year and be promised the chance to turn a health tide that is overcoming a region. All they have to do is agree to stay in an area that is woefully short of doctors for a four-year stint. The Mississippi Legislature funded the program five years ago, reports Jeffrey Hess of Mississippi Public Radio. The only other condition for employ is that the doctors must have originally come from a small Mississippi town that was far from health care. The problem in Mississippi is acute. In rural areas of the state, obesity and diabetes are the norm, and life expectancy is far lower than the national average, Hess notes. At least one county has no doctor at all. The program's recruiter says she's either looking for mavericks or missionaries. So far, more than 40 doctors are signed up to leave their residency and head straight for the Delta. In rural Kansas, a small hospital is calling for missionary types, too, in something it calls "mission-focused" medicine. Based in a small town of 855 an hour north of Dodge, Kan., the Ashland Health Clinic has just 24 beds. 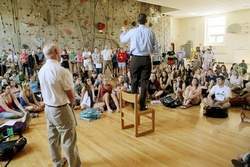 It needed doctors who wanted to be in Ashland, but who felt a higher calling. The idea was to offer doctors who worked at the clinic eight weeks off every year to do missionary work overseas. Harvest Public Media's Peggy Lowe explained here that doctors in rural areas must deal with lower pay and isolation and that rewards like the two-month leave worked so well, the clinic got a new nursing director with the same sweet deal. 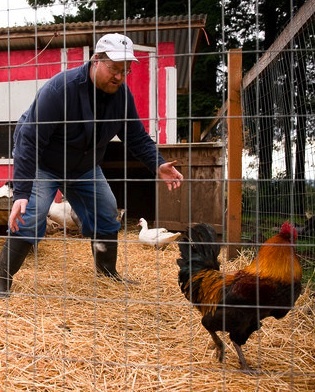 The urban chicken retirement movement has led two farm animal sanctuaries and self-described chicken slinger Pete Porath (left) to expand their operations to accommodate the birds. 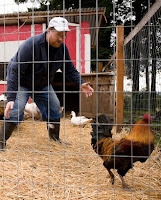 Porath brokers chicks to feed stores and other buyers from his five-acre farm in Estacada. He told New York Times reporter Lee Van Der Voo that he "rehomes" 1,000 to 2,000 birds a year, most from Portland. He said the birds go to farms where they eat pests, turn compost, keep grass down or are used for breeding or as pets. The landscape of rural Kansas, which is likely very similar to the landscape of many other rural areas in the Great Plains, is littered with abandoned grain silos, decaying barns, chicken coops and stone homesteads. They are all signs of "a region that has struggled with generations of exodus," reports A.G. Sulzberger of The New York Times. But, he writes, "There are unexpected signs of rebirth." 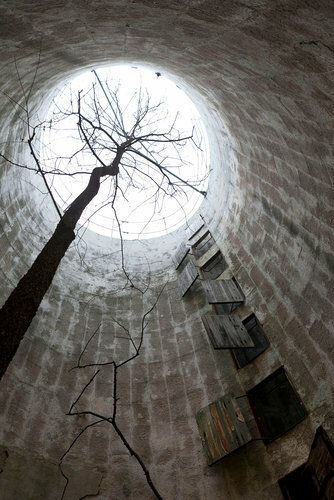 Many old silos have transformed into tree nurseries, completely by chance. The empty, hollow structures catch seeds, then protect saplings from prairie winds and "reserve a window of sunlight overhead like a target," Sulzberger reports. "In time, without tending by human hands, the trees have grown so high that lush canopies of branches now rise from the structures and top them like leafy umbrellas," he writes. A new study predicts that climate change will affect corn prices more over the next 30 years than other factors previously identified, including oil prices, trade policies and federal biofuel mandates, reports Stephanie Strom of The New York Times. The study, published in the journal Nature Climate Change, suggests that frequent heat waves will cause sharp price spikes unless farmers develop heat-tolerant corn varieties or move production into Canada. The job of Wildlife Services, a branch of the U.S. Department of Agriculture, is to kill wild animals that are deemed a threat to agriculture, the public and the environment. Lately, the service has also set traps and snares for coyotes, black bears, beavers, mountain lions and wolves. These traps often catch pets or federally protected animals. An investigation by Tom Knudson of The Sacramento Bee found that the agency reveals little about these collateral killings and reports that the practices used to kill animals are best described as "indiscriminate, at odds with science, inhumane and sometimes illegal." Knudson's detailed investigation found that the agency, since 2000, has accidentally killed 50,000 animals that were not deemed as problems. These include federally protected golden and bald eagles, more than 1,000 dogs and several rare or imperiled species. In addition, since 1987, at least 18 employees and several other people have been exposed to cyanide by triggering spring-loaded traps with poison cartridges. Many people have also been injured during crashes of aerial gunning operations. Further, Knudson reports several scientific studies have found that "the agency's war against predators ... is altering ecosystems in ways that diminish biodiversity, degrade habitat and invite disease." Last month, Sioux and Assiniboine tribe members celebrated as about 60 bison ran into a prairie that hadn't been grazed by bison in almost 140 years. Just 11 days prior, 71 pureblood bison, descended from one of Montana's last wild herds, were released nearby onto untilled grassland owned by a charity "with a vision of building a haven for prairie wildlife," Schweber reports. Fort Peck Indian Reservation Fish and Game Director Robert Magnan will be overseeing the transplanted Yellowstone herd. "Populations of all native Montana wildlife have been allowed to rebound except bison; it’s time to take care of them like they once took care of us," he said.